It could be an indicator of how much the far-right movement has taken hold in Europe. It might only be home to about 17 million people, but all eyes will be on the Netherlands on Wednesday. Dutch voters will determine the makeup of their 150-seat lower house of Parliament, known as Tweede Kamer. The country's general election is seen as an indicator of just how much far-right populism and nationalism have taken root in Europe following the U.K.'s Brexit vote last year. And France and Germany will be watching. Far-right movements have taken hold in both countries, which are also set to hold elections this year. "The Dutch want their country back," Geert Wilders said in a video following his December conviction for inciting discrimination. Wilders is the leader of the far-right nationalist Party for Freedom. He's become arguably the most recognizable face of the far-right in Europe. The party has said it will "de-Islamize the Netherlands," stop the immigration of people from predominantly Muslim countries and work to have the Netherlands leave the European Union. The Party for Freedom's message has apparently resonated with Dutch voters. As recently as last month, polls indicated it would be a close race between Wilders' party and current Prime Minister Mark Rutte's center-right People's Party for Freedom and Democracy. Rutte has tried to move further right in recent months to appeal to more voters. More recent polls have shown the Party for Freedom coming in second to the People's Party for Freedom and Democracy. 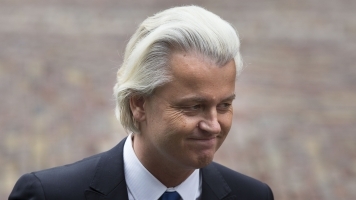 Even if the Party for Freedom were to pull off an upset, Wilders would likely not become prime minister. That's because 28 parties are participating in the election, and no one party is expected to win the majority of seats. So the Party for Freedom would need to form a coalition government in order to rule, and other parties have said they're unwilling to do so.